Keep your smile and gums healthy with the dental services from Red Bank Dental Associates, a dental office located in Red Bank, New Jersey. Our devoted staff offers the quality services you need to keep your sparkling smile picture perfect. Like your body, your teeth and gums need proper maintenance to stay healthy. The dentists and staff at Red Bank Dental Associates have offered a number of dental services to people throughout the area for more than 25 years. When you schedule a dental appointment at our dental clinic, we offer the quality care you deserve, while providing the quality dental services you need. Our Dentists, Drs. Thomas Driscoll and Chris Vockroth, and their staff always strive to provide comfort and comprehensive dental treatment to all patients from children to older adults. Don't forget to like us on Facebook. 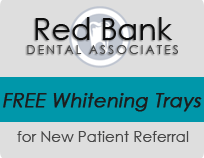 Contact us today in Red Bank, New Jersey, to schedule an appointment for one of our affordable dental services.